Adult pair; male in foreground. aesculapii: genitive of Aesculapius (Latin form of Asklepios, Ἀσκληπιός), Ancient Greek god of medicine who carried a staff with one or two snakes wrapped around it, in reference to this species’ snakeskin colour pattern . Endemic to the Rakhine Yoma/Arakan mountains in Rakhine state, western Myanmar; this range forms a natural barrier which cuts the state off from the remainder of the country. Type locality is ‘Thande, Kananmae Chaung, near Leldee village, by foot 45 minutes from Gwechaung village at kilometer 18 on road Thandwe-Taunggok, 18°35’39″N, 94°22’45″E, Rakhine State, Myanmar’. It was originally collected from a handful of streams and rivers of the western, interior, slopes of which the type specimens originated from the Kananmae Chaung, a coastal rivulet draining into the Bay of Bengal (Kullander and Fang, 2009). Myanmar can be considered a centre of diversity for the genus with eight officially-recognised species, seven of which are endemic to the country. The type locality is a shallow (~30cm deep) section of the stream running close to the village of Leldee through what is described as “low forest” by the authors in an earlier (2004) paper but given as flowing out of the forest into agricultural land by 2009. At time of collection this was around 3m wide and the substrate composed of a mixture of gravel, pebbles, rocks and leaf litter over which flowed clear, transparent water. This was moving quite slowly resulting in the formation of a number of small pools within which the fish were found. Sympatric species included Rasbora daniconius, R. rasbora, Aplocheilus panchax, Lepidocephalichthys berdmorei, Batasio elongatus, Garra flavatra, Garra vittatula, Olyra burmanica, Pterocryptis cf. berdmorei and Sicyopterus fasciatus along with unspecified members of Danio (given as Danio sp. aff. dangila),Devario, Rasbora, Pangio, Channa, Mastacembelus, and Anguilla. Most of the populations discovered inhabited similar environments although one was found in a stagnant pool with a substrate of sand and leaf litter where a small river flows for part of the year. In fact all its habitats are seasonal in nature; Rakhine is located within a tropical monsoon region and has a pronounced rainy season between May and October, while at other times it can be quite dry. The streams thus swell in depth by a metre or more and flow much more rapidly during the wet season. Collection of fish, for both scientific and commercial purposes, is normally conducted during the dryer months in monsoon-affected areas due to difficulties encountered during times of high water levels and/or poor weather. One of the smaller members of the genus reaching 25 – 30 mm in length. A group will need an aquarium with base dimensions measuring upwards of 60 ∗ 30 cm. This species looks particularly effective in a heavily-planted arrangement with a darkish substrate, and can appear a little washed out in sparsely-decorated set-ups. We suggest keeping it in a well-planted aquarium or set-up designed to resemble a flowing river or stream with a substrate of variably-sized rocks and gravel and some large water-worn boulders. The water should be well-oxygenated with a degree of flow although torrent-like conditions should be avoided since small danionins tend to occupy calmer stretches and marginal zones in nature. The tank can be further furnished with driftwood branches and hardy aquatic plants such as Microsorum, Bolbitis or Anubias spp. which can be grown attached to the décor. The aquarium must have a very tightly-fitting cover as this species is an accomplished jumper and can fit through surprisingly small gaps. Temperature: Water temperatures in its native streams have been recorded between 22 – 27 °C during warmer months of the year. Presumably consitions are cooler during the wet months of the monsoon but we don’t know to what extent. 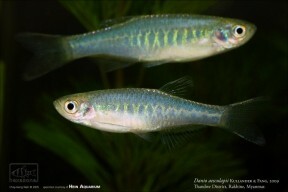 pH: The pH in its natural waters has been measured at 6.9 – 7.1 and similar values are recommended in the aquarium. Hardness: Use soft water of 18 – 90 ppm. A good quality dried product can be used as the staple diet but this should be supplemented with regular meals of small live and frozen fare such as bloodworm, Daphnia, Artemia, etc. for the fish to show the best colouration and conditioning. This species is generally peaceful making it an ideal resident of the well-furnished community aquarium. As it places no special demands in terms of water chemistry it can be combined with many of the most popular fish in the hobby including other small cyprinids as well as tetras, livebearers, rainbowfishes, anabantoids, catfishes and loaches, though as always when selecting a compatible community of fish proper research is essential and its adult size must be taken into account. A set-up based around fish from the western Rakhine Yoma will be more difficult to achieve as most are unavailable in the aquatic trade. There remain a few potential options though, some of which are listed in the ‘Habitat’ section above. 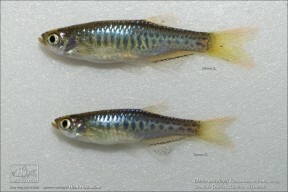 Sexually mature females are usually rounder-bellied and a little larger than males. The differences are especially clear when the fish are in spawning condition as the males intensify in colour and the females fill with eggs. The dark bars in the front portion of the body also tend to be noticeably more thin and elongate in females. When the fish are in good condition they will spawn often and in a densely-planted, mature aquarium it’s possible that small numbers of fry may start to appear without intervention. The water itself should be very soft, of slightly acidic to neutral pH with a temperature towards the upper end of the range suggested above. A small power filter can be added initially and this should be positioned so that the flow is directed down the full length of the tank; alternatively simply install a mature sponge-type filter. The adults will eat any eggs they find and are best removed after a couple of days at which point the power filter (if using) should be switched for a sponge-type unit in order to avoid fry being sucked into the mechanism. Incubation is temperature-dependant to an extent but usually takes around 36 hours with the young free-swimming 3-4 days later. Initial food should be Paramecium or a proprietary dry food of sufficiently small (5-50 micron diameter) grade, introducing Artemia nauplii, microworm, etc. once the fry are large enough to accept them. Despite its official description this species continues to be traded under various names including ‘Danio sp. pantheri’, ‘D. sp. hieroglyph’ and ‘D. sp. TW03′. 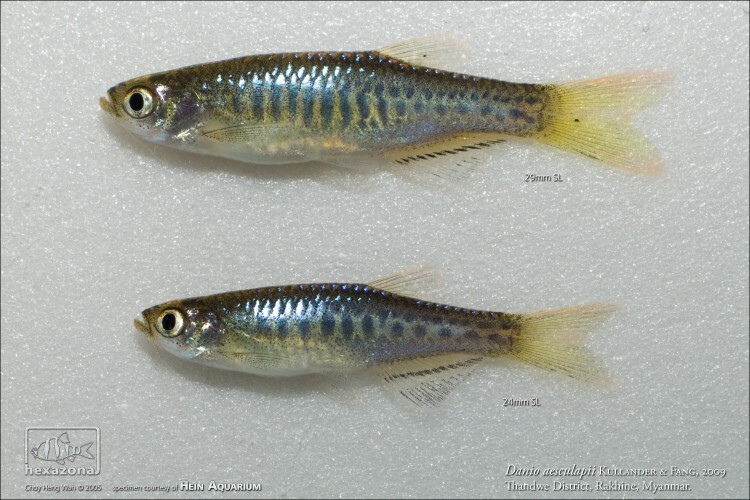 The first specimens were probably collected by Sunder Lal Hora in 1937 but misidentified as Danio (currently Celestichthys) choprae. B. aesculapii is distinguished from congeners by the following characters: colour pattern comprising 6-7 brown vertical bars anteriorly on side and two horizontal rows of small brown spots posteriorly; D stripe absent; no dark stripes on caudal fin; 12 circumpeduncular scale rows; 6 branched dorsal fin rays. 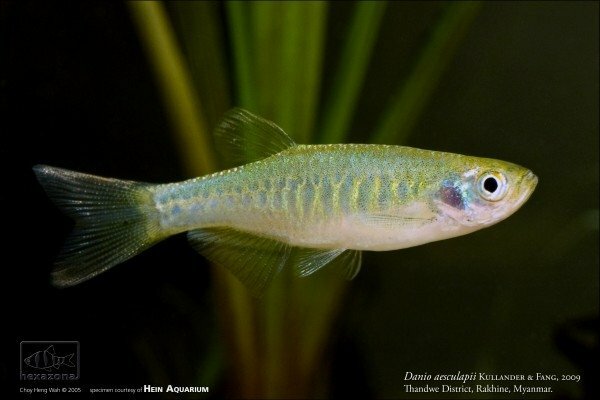 Danio aesculapii, a new species of danio from south-western Myanmar (Teleostei: Cyprinidae).